The Cadillac Escalade continues to be the most stolen vehicle in America, according to the nation's insurance industry. 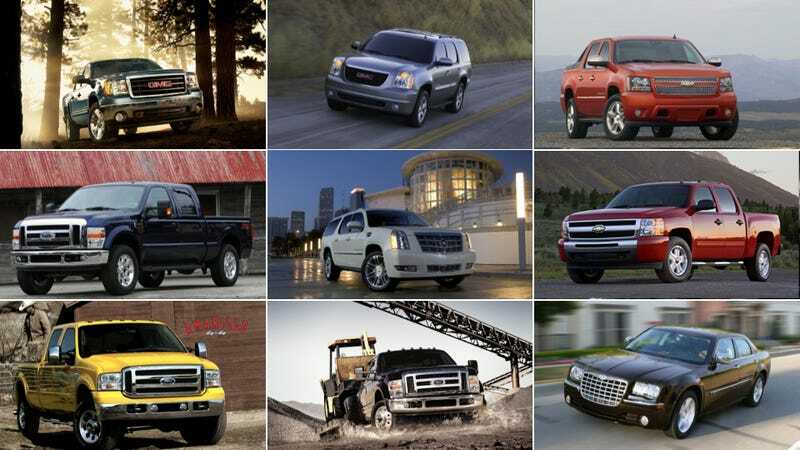 It, and these nine other vehicles, make up the latest list of the ten most likely to be stolen. It's one thing to simply add up how many cars of any given model are stolen every year. It's quite another to compare that with registrations to see how likely a model is to get swiped, as the Highway Loss Data Institute did for vehicles from the 2008-2010 model year. A research arm of the insurance industry, HLDI also calculates the value of theft losses per vehicle model — which will inevitably be higher for vehicles with large open beds. Outside of trucks, sports cars and hot versions of regular sedans, like the Chrysler 300C Hemi, also prove popular. But the Escalade occupies a special place in the Chop Shop Hall of Fame; all four variants of the 'Slade are more likely to be stolen than any other vehicle. The EXT tops the list with 14 theft claims per 1,000 insured vehicle years, or more than 8 times the average. General Motors says it's putting more anti-theft tech into new Escalades to stop senseless swiping, including beefier steering columns and sensors that set off the alarm when its windows are broken or if its loaded onto a flatbed. HLDI says the rates for new vehicles are dropping, but that professional thieves inevitably adapt. Click through the gallery above to see the list, with theft rates per 1,000 insured years and the average insurance loss per claim.